Golf game got you down? 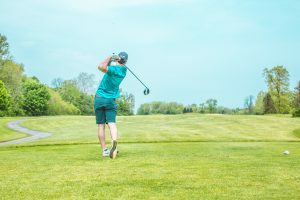 If you are having pain or difficulty with strength or mobility in your golf swing, are recovering from an injury, or if you just want to improve your golf game, Axis Sports Medicine can help. We can analyze your golf swing using a 16-point physical screen from the Titleist Performance Institute, which we are able to break down even further, to pin point the specific areas of dysfunction. Video analysis is also available to examine in-depth, how any areas of dysfunction are related to the golf swing. A personalized program, utilizing both manual therapy and exercises, will be provided based on these findings. By optimizing your body’s mobility and strength, you will prevent injuries and, most importantly, improve distance in your swing! If you are interested in setting up a golf swing analysis or have any questions regarding golf-specific rehabilitation, please contact Sean Juarez at our Avon or Eagle clinics.